Malocclusions are common in animals, and indeed, some of them are considered 'normal' for certain breeds of dog (eg Boxer) and cat (eg Persian). 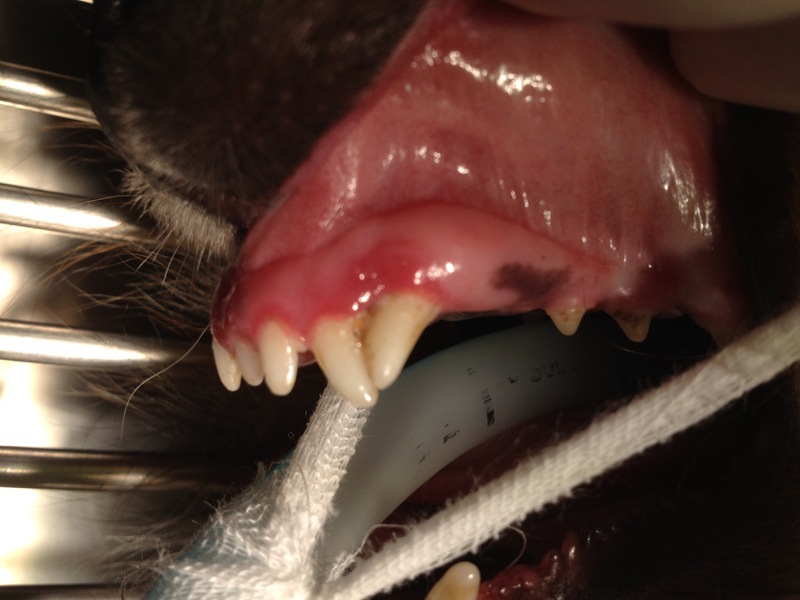 A malocclusion is any deviation from normal anatomy, and for animals we consider 'normal' anatomy to be that of the mesencephalic dogs such as Border Collies or German Shepherd dogs. Malocclusion, in general, can involve either one or two teeth (dental malocclusions) or can involve the whole jaw (skeletal malocclusions). Dental malocclusions generally involve teeth that are angled in an abnormal direction. Skeletal malocclusions usually involve one or both jaws being too short or too long. Our absolute priority with malocclusion is not the cosmetic appearance, but whether the occlsuion is comfortable and functional. Malocclusions will often cause pain through damage to the oral soft tissues or through tooth-tooth contact, and tooth-tooth contact may affect the normal function by preventing an animal from being able to close their mouth properly. Pain and discomfort from malocclusions can obviously affect the way animals eat, but can also affect the way they play, interact with other animals and can often cause behavioural problems associated with head touching or examination. Treatment of malocclusions can be very complicated and sometimes unpredictable, and should not be undertaken without adequate training and facilities. Some malocclusions may not need any treatment, if they are not causing discomfort or if they aren't affecting function. However, if they do need treatment then there are generally 4 options. Treatment may involve just one of these procedures, or a combination, in order to achieve a comfortable and functional bite. The eruption of adult teeth is very complicated and sometimes if the deciduous (primary) teeth persist for too long, it can cause the adult teeth to remain in the wrong position. This often affects the mandibular canine teeth and will cause the crowns of the teeth to be too narrow, instead of flaring into the normal space between the maxillary 3rd incisor and canine teeth. These can then cause severe trauna to the mucosal lining of the oral cavity, in particular the palatal mucosa. This can go on to affect the way the maxilla and manible grow as their growth is inhibited by the contact with the opposing jaw. Treatment for these cases may involve the orthodontic movement of the tooth/teeth to try and move them to a functional and comfortable position. Sometimes we will reduce the height of the crown of a tooth, and then use endodontic treatment. Sometimes this will combined with a gingivoplasty of the opposing jaw. The treatment options are always discussed at length with the owners as some treatments are better suited to certain cases and patients. If traumatic malocclusions are left untreated, then significant problems can develop. In this case, the damage to the soft tissues and the bone of the upper jaw were so great, that holes had developed around the teeth (as demonstrated by the probes placed in these photographs). 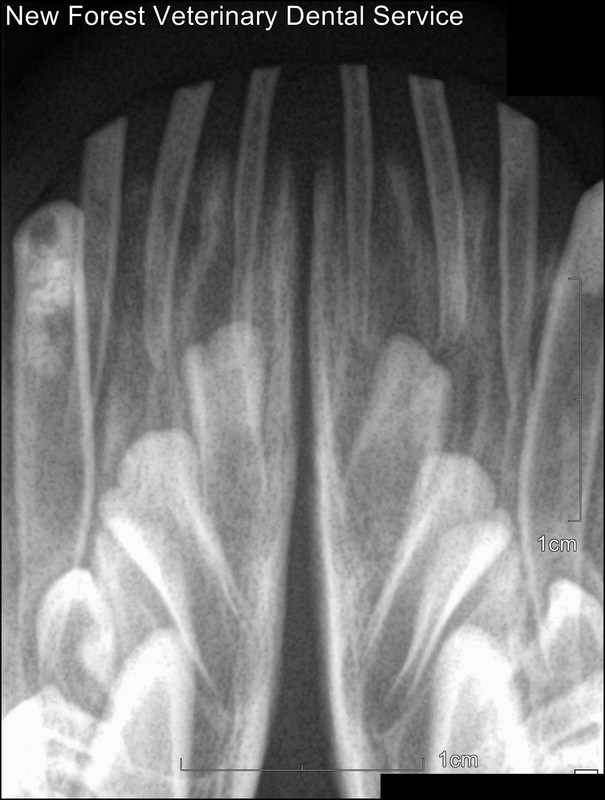 Lance teeth (or rostroverted maxillary canine teeth) are a common malocclusion, which is especially prevalent in Shetland Sheepdogs. These upper canine teeth point forwards instead of pointing downwards as you would normally expect. They are often positioned in front of the lower canine teeth instead of behind. The main concern with these teeth is that they are often in contact with the lower canine teeth which can be uncomfortable, and sometimes can prevent the mouth from fully closing. Due to their position, they will often be overcrowded against the upper 3rd incisors, which will promote the development of periodontal disease here. These teeth can be moved using orthodontic techniques and can achieve a normal position within the mouth. Interceptive orthodontics is the treatment of immature patients who still have their primary (deciduous) teeth but who have already developed a malocclusion. Whilst these malocclusions may have a significant genetic component, they may also be caused by the upper and lower jaws becoming 'locked' together by the primary teeth catching on the soft tissues of the mouth. The only way any genetic potential can be utilised, is to extract the primary teeth. This also eliminates the discomfort caused by these malocclusions. This is a complex balancing act between the anaesthetic risks to very young patients and the potential benefits of correcting their jaw growth. 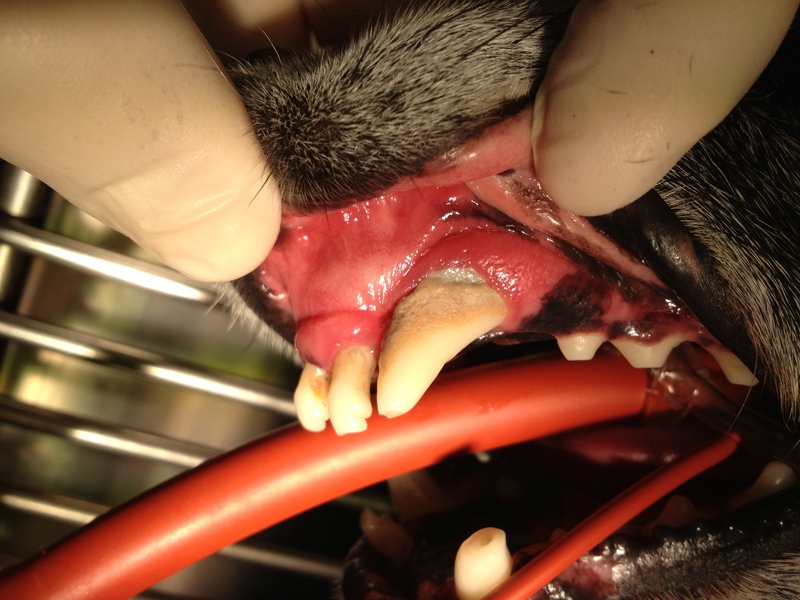 Extraction of these teeth is also complicated by the position of the permanent teeth within the jaw bone (see right). If you have a patient that you think would benefit from interceptive orthodontics, then please contact us and we can discuss all of the options with you.